My name is Anthony Heredia, and I am a part of Sembrando Semillas in Mora. This year myself and other youth from Sembrando Semillas were able to attend "Rooted In Community Youth Summit" to represent NM Acequia Association, acequia youth, and our own communities. Rooted In Community (RIC) is a national grassroots network that empowers young people to take leadership in their own communities. 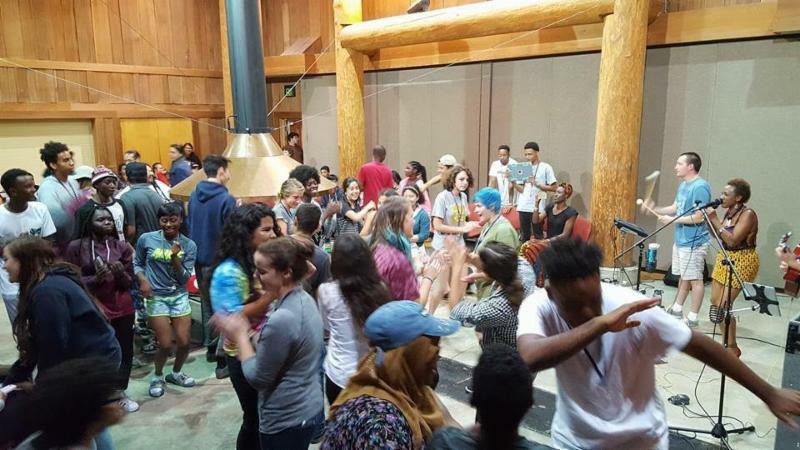 This years Rooted In Community Youth Summit was held in Olympia, WA at the Evergreen College. The theme for this year was "Honoring Our Land: We lend our voice, We lend our hands". When we first got to the Evergreen State College there was an opening ceremony. They played live music and sang. What's really cool is that even though nobody knew each other, everybody started dancing together. 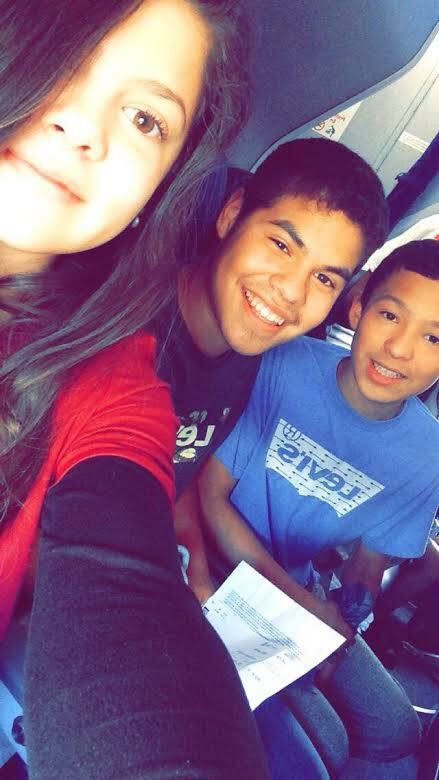 Sembrando Semillas de Mora youth on the plane to Olympia! Alycia Cardenas, Anthony AJ Heredia, and Danny Martinez. 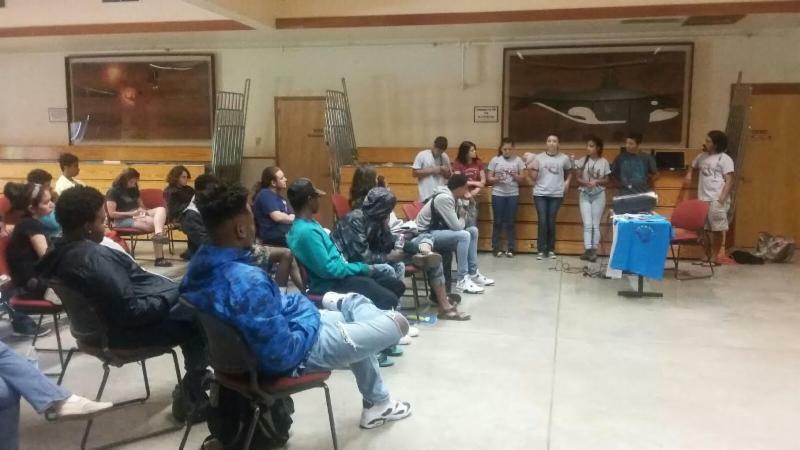 Other youth from Abiquiu and Atrisco also attended on behalf of Sembrando Semillas. The next day, we the youth from Sembrando Semillas gave a presentation to other youth. The presentation was all about our work in the program, New Mexico's foods, acequias, cultures, and way of living. On the third day, everybody went on field trips. There is a farm connected to a park, and anyone in the city can just go and pick foods. The fourth day, which was my favorite day, we were able to do a safe protest. We walked through the town heading to the capitol holding signs, saying different chants, and playing live music. The protest was about protecting water and salmon from pollution. When I first heard about the Rooted In Community Youth Summit it automatically caught my attention. I wanted to go because I wanted to learn more about the struggles others are having, and how people are dealing with them. When I heard that people were coming from around the country I also wanted to learn about different cultures and foods. I met so many cool people and became friends with everyone I talked to! When Rooted In Community ended, I had a whole different view at looking at everything. All I want to do is help with all of the struggles we're having and stop world hunger! I want to tell my whole community and other students about this program and everything that I have learned. It was an unforgettable experience! Sembrando Semillas presenting on behalf of the acequia projects, initiatives, and food preservation in New Mexico. This experience will help me become a youth leader in my community because I can tell the other youth I go to school with about my experience and all of the struggles this world is having. I can also give small presentations at my school about what I learned. I want to keep being even more involved with Sembrando Semillas because I want to learn a lot more about our own struggles that we're having and I want to help. I also want to learn more about different farming methods. Que Vivan las Acequias! Que Viva Rooted in Community!